I’ve recently rediscovered the powers of Activated Charcoal… Those of you who know me, know that I LOVE Hexagons… they are like my little breadcrumbs to follow through life. I’m pretty much obsessed with them… I see them in everything and everywhere. Hexagons are inherent in Carbon molecules, more particularily, in the C60 molecule, there are 60 carbon molecules connected by covalent hydrogen bonds.. you don’t need to know anything about chemistry to just appreciate the symmetry and beauty of this particular carbon formation of molecules. One can even eat these so called “Buckyballs” which are scientifically shown to reduce the powers of aging! Due to the unique molecular structure of C60 it is considered (among other things) a powerful antioxidant as it can donate unlimited electrons without losing it’s own integrity of structure. It has been shown to go into the mitochondria of dying or even dead cells and regenerate them! Read more about C60 Carbon molecules here: http://c60.net/ or http://c60antiaging.com/ where you can actually purchase C60 for consumption. I have been taking it, not so regularily, for the past couple of years now. I DO notice that I feel really good when I take it. However, I digressed, back to Activated Charcoal. Commonly referred to as Active Carbon or simply Carbon, Activated Charcoal is produced from organic materials such as coconut fiber, nutshells, peat, wood, or pitch through one of several processes involving the use of oxygen and high temperatures to open millions of micro-pores within its atomic structure. Because of this highly-porous structure, Activated Charcoal is extremely absorptive making it ideal for a variety of medical, beauty and household uses. AC absorbs other organic compounds by attaching to them at a molecular level. When introduced into the digestive tract, AC traps and holds toxins and chemicals while ignoring the phospholipid bilayer that makes up the lining of the intestines. Once all of their copious number of bonding sites are filled, AC particles pass harmlessly out of the body carrying the trapped poisons with them. Activated Charcoal can be ingested after swallowing poison or in case of accidental overdose to reduce the risk of serious harm to the body – especially helpful if immediate medical treatment is not available. For this reason alone, it is always a good idea to keep a bottle or two of Activated Charcoal around the house or in your first aid kit. A liquid suspension of Activated Charcoal can also be administered to pets who have been exposed to household chemicals such as insecticide, rat poison, fertilizer, toxic cleaners, etc by use of a feeding syringe. Remember, if you or someone you know has ingested poison, seek medical attention immediately! Carbon is not a substitute for professional medical treatment and should only be administered after contacting Poison Control. If you’ve ever had a water filtering pitcher such as those made by Brita, you’ve probably seen the little black specks of AC that sometimes escape from the filter. 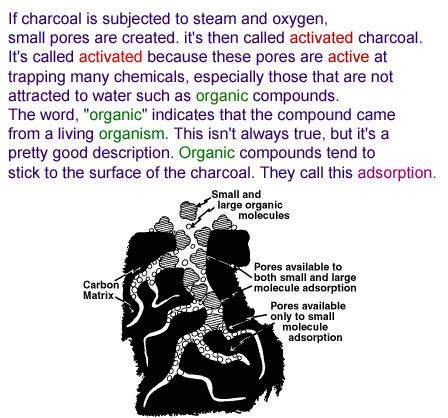 For the same reason that it is used to filter toxins from the digestive tracts of humans and animals, another application of Activated Charcoal is to filter impurities from water. Furthermore, Activated Charcoal if perfect for air filtration in that it is odorless and catches a majority of airborne contaminants. Great for those prone to respiratory ailments, you can buy them from most supermarkets and home improvement stores, or make your own! Activated charcoal can be taken orally to regulate gastrointestinal function, more specifically to reduce bloating and flatulence, remove unwanted toxins that may hinder digestion, and promote regular bowel movements. Side effects of taking Activated Charcoal are not common, but they do exist. As always, consult a physician for more information before taking any new supplements. Try mixing Activated Charcoal with Aloe or water to create a poultice that will draw poison from insect bites and stings and even snake bites. If administered within a few minutes of the injury, this treatment will reduce both pain and swelling. Always be sure to monitor any injury of this nature as many bites and stings can be fatal if not treated quickly and with the proper antidote. If you see red streaks under the skin, excessive swelling, or unusual color around the wound, seek medical attention immediately. Activated Charcoal can be used with toothpaste or by itself, with a toothbrush or as a mouth rinse to whiten teeth naturally. Carbon bonds to many of the organic compounds that stain teeth. It is also worth noting that activated charcoal is softer than other abrasives frequently used in commercial toothpastes, ie: calcium carbonate, aluminium hydroxide, silica, etc. While Activated Charcoal may not scrub plaque from teeth in the same manner as store-bought paste, it will affect a noticeable difference in the appearance of surface stains. When mixed with aloe, water, and essential oils such as tea tree or eucalyptus, Activated Charcoal can be mixed into a cleansing mask for your face or incorporated into a body scrub. 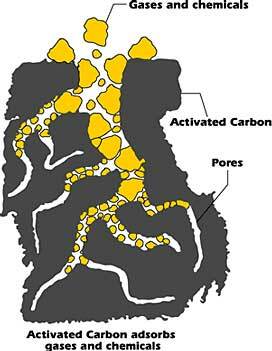 While the Carbon works wonders to clarify skin of organic impurities, it may also linger as black dots in your pores. You can use steam, a hot wash cloth, and baking soda to remove these. Just as Activated Charcoal can pull contaminants from your pores, it can also be mixed as a poultice treatment to draw toxins from the body. Your skin already does a great job of ejecting toxins from your body using sweat as a carrier (one of the main reasons to always stay well-hydrated.) Still, toxins can become trapped in muscle and adipose tissues causing soreness, lethargy, and other health problems. Try mixing Activated Charcoal with Bentonite Clay (I use Dynamite Brand Miracle Clay) and Coconut Oil to create a detoxifying poultice. Apply over sore muscles using gauze or a cloth wrap and leave on for several hours for maximum effect. Fill with distilled water and or fruit juice. It tends to look like a glass of coke! Chug it down.. notice your stool turn black as it cleans out your digestive system. The Diatomaceaous Earth acts as a parasite cleanse, and literally kills parasites and carries them out of your body with the charcoal. Do not take this after taking vitamins or minerals or even medication as it will clean them out of you. Take vitamins once your stool has come out black. You will better absorb them after a detox anyhow. Back in the days before formaldehyde and other harmful chemicals, women used Charcoal and other burned herbs and woods as makeup pigments! Cleopatra was reputed to have used Charcoal to blacken her mesmerizing eyes with as well as bathing in it with milk and honey. I’ve found a few recipes for Charcoal makeup. Here’s a few I’ve tried. Natural Mascara: For a small amount to try it out use about a tsp of Vitamin E oil, 1 tsp of coconut oil, 1/2 tsp of Aloe gel, and about a tsp of Activated Charcoal. Mix it up well and put in a cleaned used mascara container or buy a new empty one online. Natural Eyeliner: Again this is for just a small amount. 1 oz each of Coconut oil and a butter. I like Cocoa butter, but you can use shea or another type. Melt together gently, using a double broiler or in a glass measuring cup in a pot with a small amount of water in it over the stove. Once melted, add about a tsp of activated charcoal and mix well. Put into a small jar or container and use with a brush or an old eyeliner container brush. Make sure to clean it well before using. You can add vitamin E to help preserve. Natural Eyeshadow: Just use the Activated Charcoal, as much as you like, for pure black.. add some cocoa powder to make a more brown shadow, put in container and use a small brush to apply.. that’s it! So easy! And it’s somewhat smudge and waterproof.